When I was eleven years old, I remember flipping through the pages of my Spring 1986 issue of Seventeen magazine and seeing the most gorgeously chic bedroom ev-ah! The comforter was a tubular striped yellow/gray and the curtains an awesome yellow/gray polka-dot. I excitedly ran upstairs to share my new found passion for yellow and gray with my mother. Mom, there is a new color combination out now. Isn’t it fabulous??? She glanced at my page and replied flatly, “Yellow and gray was popular back when I was your age. I grew up with it. It’s a very cold look.” My mom has fabulous taste, but her style is highly traditional and everything about this bedroom screamed trendy contemporary. Drat! No new yellow and gray bedroom for me. However, I quickly latched onto peach and mint green and received a bedroom makeover in those more mom-friendly colors and all was right in my pre-teen world once again :). Here are some more current inspiration pics that I’m loving right now. As you’ll be able to tell, my love for this contemporary fad bends more towards the traditional. What can I say? I’m my mother’s daughter after all! How do you feel about combining a sunny with a gray day? It somehow works, no? If you have yellow walls throughout your home and are trying to find a way to update your look, this may just be it! I am obsessed with yellow and gray, this post is total eye candy! I love the yellow front door. It's so cheery and inviting. ^^^Felicia, thank you SO much for sharing her blog with me! We are moving next month and this is going to be my color scheme for our living room. Hello! I am a new follower, I just loved your post! One of my good friends love gray and yellow so I passed it on to her. We had a baby in October and did his nursery in all yellow and gray. We didn't know what we were having beforehand, but we found yellow and gray to be a lovely gender neutral palate that worked. I love it! Gray and Yellow is one of my favorite color combos!! 🙂 Opposites do attract in all sorts of ways I think! Yellow keeps popping up like a daisy in my life… I used to detest it, now I am secretly falling in love with it. Lovely post. Wow!! Looks like yellow is the new red 🙂 Really really like the color combo & am now thinking where I can add it to my house! Thanks Beth! No way! I thought I was the only one who had a peach and green bedroom as a teenager! My green was a tad more teal than mint, but green none the less. I adore gray and yellow. My daughter has gray/ silver walls with black and yellow accents. Such a beautiful color combo! Great pics. I love gray and yellow together, I think they make for the perfect combination. I originally wanted to paint the outside of my house yellow, with gray trim and dark gray shutters, it didn't work out unfortunately. I LOVE it though. I adore yellow and gray! Your inspiration came at just the right moment. I currently have a yellow living room that turned out much too bright and I am toning it down with a heavy dose of gray. I just couldn't face getting rid of all the cheerfulness the yellow creates! This is crazy, I just got in from doing some errands and passed a yellow and gray/grey (whatever) house… I will take a picture of it for you soon, if I remember to bring my camera…no seriously I will. Wonderful inspiration, Beth. We painted our family room yellow and I am so undecided what colors to add. I'd love a white sofa but am unsure what else to do. Gray sounds like an option! I am loving yellow!! I have been debating on whether on not to throw in some yellow in our house!! You are just a doll!! Beautiful inspiration, Beth. One question – all these years later, do you have any yellow and gray in your home? Thanks for the inspiration…my front room is yellow and grey right now. I LOVE yellow and gray together. It is to me one of those perfect combinations of cool and warm brought together. Here is a post I did about it just a few months ago! I love this color combination. Unfortunately, I have no where to use it in my home. However, I do combine gray and yellow in my clothing. Very pretty and uplifting. Especially in the springtime. Thanks for sharing! I adore yellow and grey together. It's so chic! I LOVE yellow and gray too! I am a new follower, and I found you through Green Door Designs. My blog theme is yellow and gray! http://www.classycolumbusdesigns.blogspot.com. I hope you can stop by and check it out! i'm not really a yellow person…but i love the inspiration pics! i was thrilled to see the slider door to the bathroom…we are doing that in our bath remodel and i can't wait until it's finished! love the yellow and grey!! i was in college when the peach, mint green craze hit! it was in my dorm room and then flowed over to my married house since my aunt had sewn me a beautiful quilt. i can hardly stand to look at those colors now!!! Thank you… you just gave me my inspiration for my guest bedroom! I wanted something with a bit of a beachy feel, but love the new grays and light colors. I think this fits the bill with the soft pop of yellow!!! Thank you!!!!!! i remember going thru a pink and grey phase as an adolescent in the 80s. but prefer your yellow and grey these days… just bought a skirt in those colors last weekend! love all the pics, esp. the yellow barn door in the first! I love the yellow & gray color combintation! I think they compliment each other quite well! I love the pics from Sarah's house…I love Sarah Richardson! I saw that particular episode! 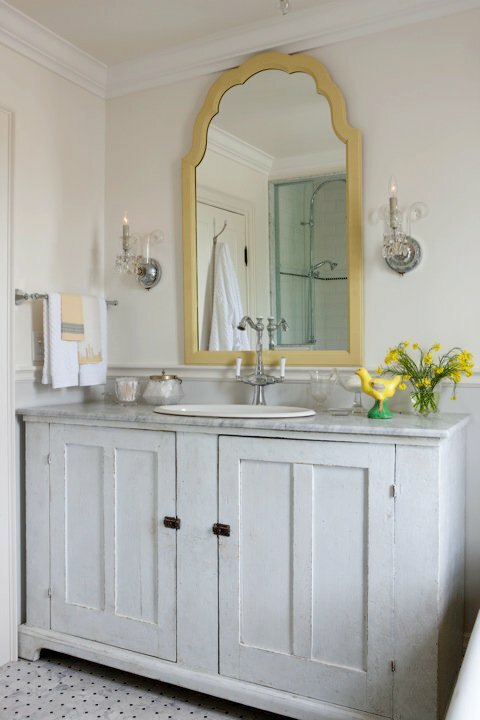 Love how she painted the claw foot tub yellow! GORGEOUS! beth, love it! very chic! Peach and mint green…hehe. Mint green was my most favoritest color back in the day. I love yellow and gray together. My oldest daughter (17) and I were talking the other day about how we wish we afford to redo her room in yellow, gray and black. I love all of these pictures. So pretty. 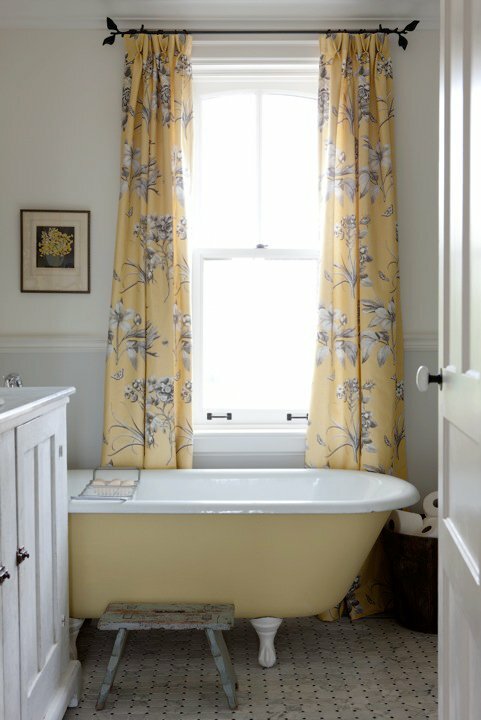 It is the perfect pairing of yellow and gray…so soft and subtle! DIVINE! 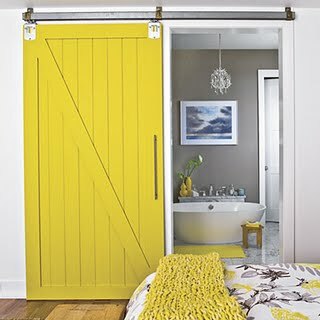 I am loving yellow right now and that yellow closet barn door is calling my name!! I absolutely love it!!! I feel like this is a very fun color combo…my whole formal living room is grey and yellow and I live the way it turned out!!! Yellow and gray..The pics are very nice..Love your blog..Happy New Year..Here's to a great 2011.. I do like yellow and grey! Grey has always just seemed like a soft black to me–it goes with anything! I'm sooooo in LOVE with yellow and gray right now! I'm thinking of using it in my bathroom, especially after seeing those gorgeous pics! They seriously made my heart start beating faster. I got so excited to try out some of these POPS of yellow, in my own home! I could hug you right now. We have the brightest, sunniest, yellow kitchen and I have been trying to find a new paint color for our adjacent living room. This grey might be it. Now, can you come down to VA and rearrange my furniture? yellow and gray go together like a horse and carriage. hope all is well beth. have a wonderful evening. I love it! I have yellow walls, but I think of gray as more of a contemporary color. I do like the pictures here though. I'll have to keep this in mind! oh how i love all of these pictures! i must say i am partial to the "sarah's house" photos. i have had the bath and kitchen episodes saved in my dvr forever and have watched them over and over…please tell me i'm not the only one:) love your board and batten…can't wait to check back and see your progress! I love that you turned out to be your mother's daughter! I just bought a new duvet that's yellow and gray. As much as I LOVE it, it's taking some getting used to. Your post helps. I love everything. Sarah's House bathroom is one of my favorites. Those curtains are beautiful!